The Russian Aerospace Forces have launched 97 cruise missiles hitting Daesh targets in Syria, the Russian General Staff said on Friday. Since the beginning of the Russian aerial campaign in Syria, Russian warplanes have carried out 5,662 sorties, the Russian General Staff said. 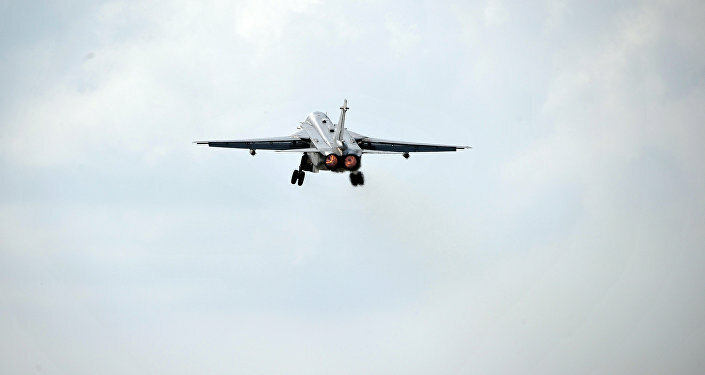 "Since September 30, 2015, the Russian Aerospace Forces have carried out 5,662 sorties, including 145 sorties carried out by missile-carrying strategic aircraft and long-range bombers, 97 launches of cruise missiles both sea and land based have been carried out," Lt. Gen. Sergey Rudskoy, chief of the Main Operational Directorate of the General Staff of the Russian Armed Forces, told reporters. Over 100 days of the Russian military operation, 217 populated areas and over 1,000 square kilometers in Syria have been liberated from terrorists. "Over 100 days of the operation conducted by the Russian Aerospace Forces in Syria, 217 populated areas and over 1,000 square kilometers were freed from terrorists." Due to Russian airstrikes destroying terrorist command centers and supply channels in Syria, jihadists started to lack fuel, weapons and supplies, Sergei Rudskoi said. Russian warplanes hit only verified terrorist targets in Syria after checking the information via various channels, the Russian Defense Ministry spokesman emphasized on Friday. "I emphasize that the strikes by our air group in Syria on terrorist targets are carried out only after data [on terrorist targets] is verified through several channels. Strikes are not carried out in case of risk for lives of civilians," Maj. Gen. Igor Konashenkov said. According to Konashenkov, this is one of the main differences between the Russian anti-terrorist campaign in Syria and that of the US-led coalition as the Pentagon may approve a decision to carry out airstrikes in an area if the number of civilian casualties does not exceed 50 people. "As we say, feel the difference. Our aviation does not even plan airstrikes if there is a possibility of civilian casualties," Konashenkov said. Russia may start to publish data on airstrikes carried out by the US-led coalition in Syria to avoid speculations. "If our collaugues remain silent about the results of their [US-led coalition] strikes in Syria, we'll have to inform the public of these facts ourselves. If someone still doesn't get that — too bad," Russian Defense Ministry spokesman Maj.-Gen. Igor Konashenkov said Friday. Russia has decided to conduct humanitarian operations in Syria, Russian General Staff head Lt.-Gen. Sergei Rudskoi said Friday. Russian Il-76 aircraft have already delivered 22 tonns of humanitarian aid to the Syrian city of Deir ez-Zor. "The main batch of [Russian] humanitarian assistance has been sent to the city of Deir ez-Zor, which has been besieged by terrorists for a long time." Earlier, an informed source told Sputnik that Damascus and armed opposition groups operating in Syria had reached a consensus on allowing deliveries of humanitarian aid to cities suffering from the fight between the conflicting parties.